UC Berkeley is again the top public university in the world and is fourth overall in the 2015 Academic Ranking of World Universities (ARWU), released over the weekend. The global ranking of universities, published by Shanghai Jiao Tong University, focuses on quality of faculty and research. 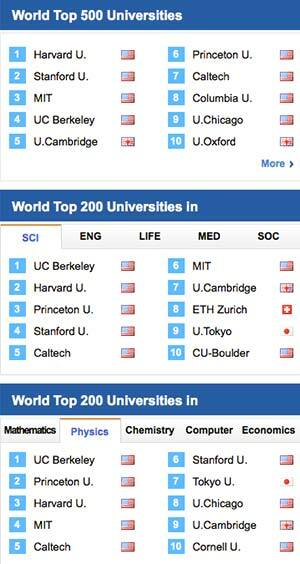 And among all universities, it follows just Harvard, Stanford and MIT. Among public universities, UCLA is second (12th overall), UC San Diego third (14th overall), University of Washington fourth (15th overall) and UC San Francisco fifth (18th overall). In the five broad academic fields ranked, Berkeley placed first in the area of natural sciences and mathematics, and in the top five in the areas of engineering/technology and computer sciences and social sciences. Among five specific subjects ranked, Berkeley took first in physics and chemistry, and placed in the top five in mathematics, computer science and economics/business. Berkeley has ranked among the top four institutions every year since 2003, the year the ARWU rankings debuted. More than 1,200 universities are ranked by ARWU every year and the top 500 are published, according to ARWU. Overall, the 2015 rankings said this about Berkeley: “Its faculty include seven Nobel laureates, 140 members in the National Academy of Sciences, 77 Faculty Fulbright Scholars, and 235 fellows in the American Academy of Arts and Sciences. In national surveys, Berkeley’s academic departments consistently rank among the top five in the country. According to UC Berkeley’s Office of Planning and Analysis, the ARWU methodology uses four criteria to assess a university’s ranking: quality of education (worth 10 percent of the total), quality of faculty (40 percent), research output (40 percent) and per capita academic performance (10 percent ). More specifically, these include Nobel Prize and Fields Medal winners among faculty and alumni weighted by decade received, Thomson Reuters’ Highly Cited Researchers, the number of papers in Nature and Science published between 2009 and 2013, and the number of papers indexed in Science Citation and Social Science Citation in 2013.The weighted scores of these indicators are divided by the FTE of academic staff to obtain the per capita performance rating. The total score is derived by summing these, and each institutional score is then standardized to the top-scoring university, which is assigned 100. The same methodology is applied to broad fields of academic study. Complete information on the rankings and their methodology can be found on the Shanghai Jiao Tong website. The above post is reprinted from materials provided by UC Berkeley.